Is the largest moving object on your home as safe as it should be? Put your door and opener to the test. Perform this test once every month to insure all garage door opener safety features are operating correctly. Place a one inch thick block of wood underneath the door and close it. The opener should reverse open when contacting the wood. If not, it should be disconnected immediately and repaired or replaced. Perform this test once a year to insure that your door is properly balanced and working smoothly. Disconnect opener from the door. Raise and lower the door to insure there is no binding or sticking. The door should also move upward with a minimal amount of effort. Then bring the door down to about 2 feet off the ground and release. If the door falls to the ground, it is too heavy and needs servicing. A correctly balanced door will stay in place supported entirely by its springs. This also insures that your opener will be under no strain during operation. Door springs, cables, pulleys, brackets and their hardware are under extreme tension. Do not attempt to loosen, move or adjust them yourself. Serious personal injury or even death could result from doing this. Call Kay Door Company to facilitate all your door and opener needs. Does your current opener comply to all current UL State and Federal Safety regulations? 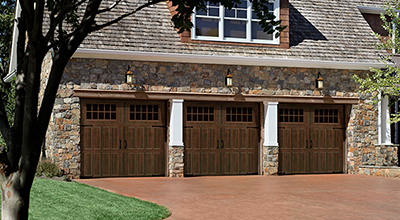 If not, it might be time to think about whether a safer garage door opener would benefit you and your family. Be compliant to UL325 Photo Sensors or better know as STB Eyes designed to sense an obstruction and instruct the operator to reverse the closing door to the full open position, giving you a 100% safety guarantee that your children, grandchildren and pets will not become entrapped under the garage door. Prevent anyone but you from opening the door by selecting a new access code each time you press the remote by hand, stopping code-grabbing thieves from getting into your home.